New from Comet, Reflections Duet. 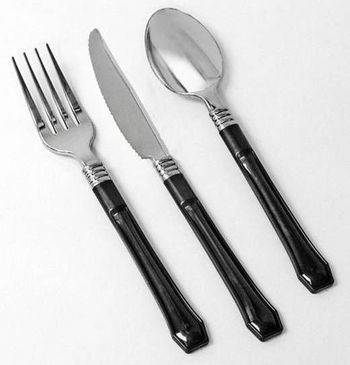 The same great silver look with a distinct black handle. This unique piece addresses both the need for elegant one of a kind presentation and the high expense associated with renting or owning flatware. Reflections Duet Silver & Black Plastic Fork 20ct. Reflections Duet Silver & Black Plastic Teaspoons 20ct. Reflections Duet Silver & Black Plastic Knives 20ct.